Here is a go-to resource for bakers of all skill levels who love new information and techniques that lead to better loaves and more flavor. These 45 foolproof recipes for delicious, nutritious, good-for-the-gut breads and pastries star a wide range of artisanal flours that are now readily available to home bakers. These flours add layers of flavor and texture, and combined with a natural starter and long fermentation, make these baked goods enjoyable even by those who have difficulty with gluten. In-depth master tutorials to starter, country loaves, and adjusting recipes for different flours are paired with step-by-step photography sequences that help visual learners get these fundamentals just right. Including recipes for one-of-a-kind rolls, scones, muffins, coffee cake, cookies, brownies, and more, this is a new take on baking for the home baker's cookbook canon. 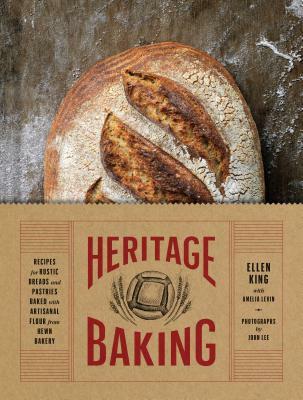 Ellen King is co-owner and head baker at Hewn. She lives in Evanston, Illinois. Amelia Levin is a cookbook author, food consultant, and writer based in Chicago. John Lee is a food and lifestyle photographer based in San Francisco.